To support a continuous integration dashboard that is scalable, performant, and flexible, the VTS Dashboard backend must be carefully designed with a strong understanding of database functionality. Google Cloud Datastore is a NoSQL database that offers transactional ACID guarantees and eventual consistency as well as strong consistency within entity groups. However, the structure is very different than SQLdatabases (and even Cloud Bigtable); instead of tables, rows, and cells there are kinds, entities, and properties. The following sections outline the data structure and querying patterns for creating an effective backend for the VTS Dashboard web service. Test Entity. Stores metadata about test runs of a particular test. Its key is the test name and its properties include the failure count, passing count, and list of test case breakages from when the alert jobs update it. Test Run Entity. Contains metadata from runs of a particular test. It must store the test start and end timestamps, the test build ID, the number of passing and failing test cases, the type of run (e.g. pre-submit, post-submit, or local), a list of log links, the host machine name, and coverage summary counts. Device Information Entity. Contains details about the devices used during the test run. It includes the device build ID, product name, build target, branch, and ABI information. This is stored separately from the test run entity to support multi-device test runs in a one-to-many fashion. Profiling Point Run Entity. Summarizes the data gathered for a particular profiling point within a test run. It describes the axis labels, profiling point name, values, type, and regression mode of the profiling data. Coverage Entity. Describes the coverage data gathered for one file. It contains the Git project information, file path, and the list of coverage counts per line in the source file. Test Case Run Entity. Describes the outcome of a particular test case from a test run, including the test case name and its result. User Favorites Entity. Each user subscription can be represented in an entity containing a reference to the test and the user ID generated from the App Engine user service. This allows for efficient bi-directional querying (i.e. for all users subscribed to a test and for all tests favorited by a user). 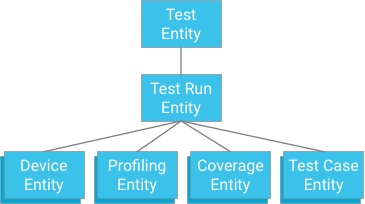 Each test module represents the root of an entity group. Test run entities are both children of this group and parents for device entities, profiling point entities, and coverage entities relevant to the respective test and test run ancestor. Figure 1. Test entity ancestry. Key Point: When designing ancestry relationships, you must balance the need to provide effective and consistent querying mechanisms against the limitations enforced by the database. Writing to an entity group at a rate faster than one entity per second is not advised as some writes may be rejected. As long as the alert jobs and the uploading does not happen at a rate faster than one write per second, the structure is solid and guarantees strong consistency. Ultimately, the cap of one write per test module per second is reasonable because test runs usually take at least one minute including the overhead of the VTS framework; unless a test is consistently being executed simultaneously on more than 60 different hosts, there cannot be a write bottleneck. This becomes even more unlikely given that each module is part of a test plan which often takes longer than one hour. Anomalies can easily be handled if hosts run the tests at the same time, causing short bursts of writes to the same hosts (e.g. by catching write errors and trying again). A test run doesn't necessarily need to have the test as its parent (e.g. it could take some other key and have test name, test start time as properties); however, this will exchange strong consistency for eventual consistency. For instance, the alert job may not see a mutually consistent snapshot of the most recent test runs within a test module, which means that the global state may not depict a fully accurate representation of sequence of test runs. This may also impact the display of test runs within a single test module, which may not necessarily be a consistent snapshot of the run sequence. Eventually the snapshot will be consistent, but there are no guarantees the freshest data will be. Another potential bottleneck is large tests with many test cases. The two operative constraints are the write throughput maximum within of an entity group of one per second, along with a maximum transaction size of 500 entities. Figure 2. Test Cases descend from Test Runs (NOT RECOMMENDED). While this approach offers atomicity and consistency, it imposes strong limitations on tests: If a transaction is limited to 500 entities, then a test can have no more than 498 test cases (assuming no coverage or profiling data). If a test were to exceed this, then a single transaction could not write all of the test case results at once, and dividing the test cases into separate transactions could exceed the maximum entity group write throughput of one iteration per second. As this solution will not scale well without sacrificing performance, it is not recommended. Figure 3. Test Cases stored independently (RECOMMENDED). At first glance, this may appear to break the strong consistency guarantee. However, if the client has a test run entity and a list of test case identifiers, it doesn't need to construct a query; it can instead directly get the test cases by their identifiers, which is always guaranteed to be consistent. This approach vastly alleviates the constraint on the number of test cases a test run may have while gaining strong consistency without threatening excessive writing within an entity group. User favorites. Can be queried for by using an equality filter on user favorites entities having the particular App Engine User object as a property. Test listing. Simple query of test entities. To reduce bandwidth to render the home page, a projection can be used on passing and failing counts so as to omit the potentially long listing of failed test case IDs and other metadata used by the alerting jobs. Test runs. Querying for test run entities requires a sort on the key (timestamp) and possible filtering on the test run properties such as build ID, passing count, etc. By performing an ancestor query with a test entity key, the read is strongly consistent. At this point, all of the test case results can be retrieved using the list of IDs stored in a test run property; this also is guaranteed to be a strongly consistent outcome by the nature of datastore get operations. Profiling and coverage data. 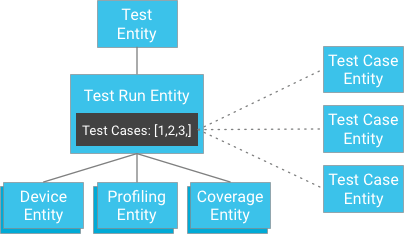 Querying for profiling or coverage data associated with a test can be done without also retrieving any other test run data (such as other profiling/coverage data, test case data, etc.). An ancestor query using the test test and test run entity keys will retrieve all profiling points recorded during the test run; by also filtering on the profiling point name or filename, a single profiling or coverage entity can be retrieved. By the nature of ancestor queries, this operation is strongly consistent. For details on the UI and screenshots of these data patterns in action, see VTS Dashboard UI.